A central Vermont man's admiration for spiders has fueled a nearly 40-year-old backyard business. "Why do we want to step on them?" Will Knight asked, referring to spiders. "Why are we so afraid of them?" Knight never squishes spiders, because they pay his bills. 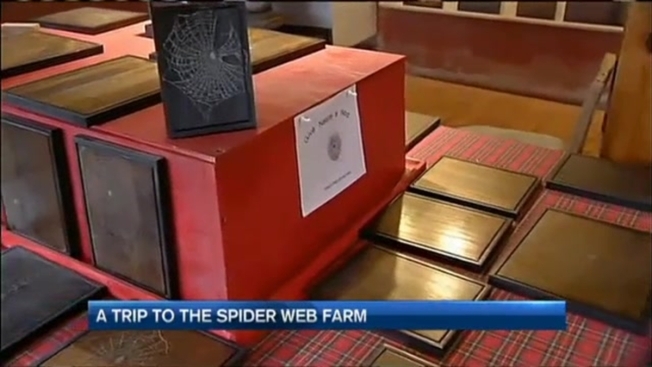 Since 1977, Knight, who is just a few months shy of 90, has run the Spider Web Farm in Williamstown, calling it the "original web site." The longtime woodworker preserves webs on $30-$60 plaques; the ones with black backgrounds tend to show the spiders' handiwork the best. Asked if it's been a good business for him, Knight laughed, "Yeah sure, my wife bought a new car!" Knight noted that he tends to sell more than one plaque every day, with customers seeking him out from far and wide, thanks to attention he has received over the years in many publications and broadcasts. In October, spiders aren't terribly active, but in the warmer months, Knight hangs frames in his barn and waits until spiders make webs in the holes of the frames. To encourage web-weaving, Knight and his wife look for spider egg sacs throughout the season, and relocate those sacs to the frames. After the spiders weave their webs, Knight explained he takes spray paint and sprays the webs white. Finally, in the most delicate step, he takes a plaque and pushes it through the hole to harvest the web. A shellacking process then further preserves the webs. So why the attraction to webs, in the first place? "I have more respect for nature than I do for a lot of my neighbors," Knight said, laughing. "I appreciate nature." Knight added that he hopes the plaques he teams up with the spiders to create will keep his customers aware of the need to protect the earth and all its creatures. "If you like baseball, you hang a picture of Lou Gehrig on the wall, because that reminds you of baseball," Knight said. "Why can't a spider web remind you of nature?" To learn more about Will Knight's Spider Web Farm, visit this website.